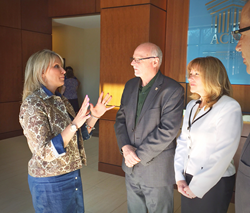 Rep. Renee Ellmers (R-NC) today paid a visit to Accreditation Commission for Health Care (ACHC) at its headquarters in Cary, NC. Discussion centered on the role of accreditation in the healthcare industry, highlighting the benefits to patients, providers, and payors. A Registered Nurse, Rep. Ellmers serves on the House Energy and Commerce Committee and is Chairwoman of the Republican Women’s Policy Committee. Today’s meeting focused heavily on compounding accreditation, detailing the benefits of ACHC’s PCAB accreditation program. As the most comprehensive compliance solution in the industry, PCAB remains the gold standard for compounding pharmacies and demonstrates compliance with USP 795 and USP 797 requirements. Its standards emphasize performance improvement in the pharmacy and require sustained compliance through annual verification. ACHC is a non-profit organization that has stood as a symbol of quality and excellence since 1986. ACHC is the provider’s choice for compliance solutions because of its personal Account Advisors, relevant and realistic standards, competitive pricing, and a friendly, consultative approach to accreditation. PCAB Accreditation reflects an organization’s dedication and commitment to meeting standards that facilitate a higher level of performance and patient care. For more information on ACHC’s accreditation programs and educational resources, or to download ACHC accreditation standards, please visit achc.org or contact customerservice(at)achc.org or 855-937-2242.